In this section, you’re going to connect your GraphQL server with the Prisma API which provides the interface to your database. The connection is implemented via the Prisma client. You’re going to start this section with a bit of cleanup and refactoring. Next, you need to update the implementation of the resolver functions because they’re still accessing the variables that were just deleted. Plus, you now want to return actual data from the database instead of local dummy data. Wow, that looks weird! There’s a bunch of new stuff happening, let’s try to understand what’s going on, starting with the feed resolver. Previously, the feed resolver didn’t take any arguments - now it receives four. In fact, the first two and the fourth are not needed for this particular resolver. But the third one, called context, is. Remember how we said earlier that all GraphQL resolver functions always receive four arguments. Now you’re getting to know another one, so what is context used for? Now that you have a basic understanding of the arguments that are passed into the resolver, let’s see how they’re being used inside the implementation of the resolver function. It accesses a prisma object on context. As you will see in a bit, this prisma object actually is a Prisma client instance that’s imported from the generated prisma-client library. This Prisma client instance effectively lets you access your database through the Prisma API. It exposes a number of methods that let you perform CRUD operations for your models. Similar to the feed resolver, you’re simply invoking a function on the prisma client instance which is attached to the context. You’re sending the createLink method from the Prisma client API. As arguments, you’re passing the data that the resolvers receive via the args parameter. So, to summarize, Prisma client exposes a CRUD API for the models in your datamodel for you to read and write in your database. These methods are auto-generated based on your model definitions in datamodel.prisma. But, how do you make sure your resolvers actually get access to that magical and often-mentioned prisma client instance? This dependency is required to make the auto-generated Prisma client work. Now you can attach the generated prisma client instance to the context so that your resolvers get access to it. Now you can attach it to the context when the GraphQLServer is being initialized. The context object that’s passed into all your GraphQL resolvers is being initialized right here. Because you’re attaching the prisma client instance to it when the GraphQLServer is instantiated, you can access context.prisma in your resolvers. Then, open the GraphQL Playground at http://localhost:4000. You can send the same feed query and post mutation as before. However, the difference is that this time the submitted links will be persisted in your Prisma Cloud demo database. Therefore, if you restart the server, the feed query will keep returning the correct links. 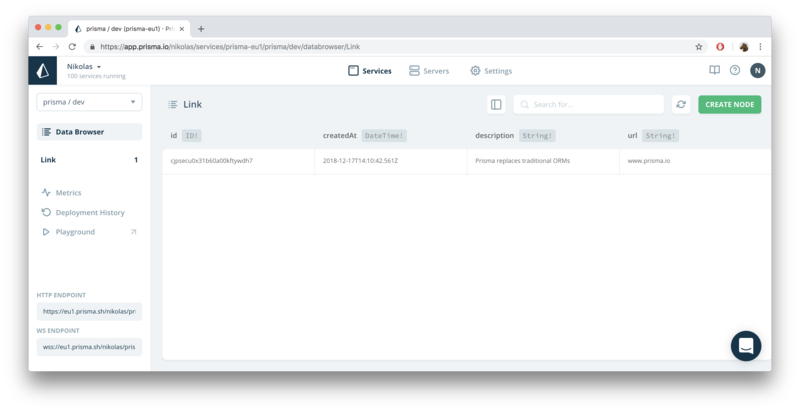 Note: Because you’re using a demo database in Prisma Cloud, you can view the stored data in the Prisma Cloud Console. What is the main responsibility of the Prisma binding instance that's attached to the 'context'?